Pythagoras believed that theoria (contemplation) led to kosmos (here an orderliness in Life), thence to catharsis (the purification of the Soul), so that by Universal Reason we can proceed from gross matter upward to the Soul of the Universe, and thence to the Divine, or God. The emphasis of Muslim thinkers on the nature of unity, that is, God, contributed to their adoption of the Pythagorean metaphysics of number, insofar as this doctrine, like early Neo-Platonism, reserved for the One a preeminent status as the apogee of all knowable reality. The metaphysics of number, with the advent of modern science (which rendered obsolete the polyhedra that Plato thought the key to the universe), would have been forgotten, had it not been for the tenth-century Brethren of Purity, who continued to worship Pythagoras. Their 52 Epistles argued, with him, that mathematics leads to moral edification as well as to intellectual insight, that it serves as a clue to knowledge of the self, which, in the classical Greek view, is the pathway to the highest knowledge, that is, to the knowledge of God. To the Muslim it little matters that many details of Pythagorean numerology are no longer credible: that we no longer believe in the four elements, the four primary qualities, the four humors. He still believes that the Soul exists and that Universal Reason leads to God. The second epistle deals with geometry, the sixth with “numerical geometric and harmonic ratios.” The substance of the heavenly bodies is elsewhere described as a “fifth nature,” a quintessence, setting them apart from other entities tied to generation and corruption. Seven heavenly bodies are divested of gravity, because, created, by God, from the beginning (as were the seven stages of the Sentence, by MM) they still cling to their places, whereas objects with gravity have been forced out of their natural places and are seeking to rejoin them. As important as reconciling mythic mathematics and modern science is belief in the doctrine that knowledge of the world must begin with knowledge of the self, that it is prior to any other knowledge, that the Muslim believer must know himself before he knows the outside world. Of the four bodies of knowledge: mathematical, physical, psychological-intellectual and theological-juridical, the third is crucial. Psychology thus becomes for the Brethren the prelude to metaphysics and cosmology (an inner as well as outer science) and thus to all learning. 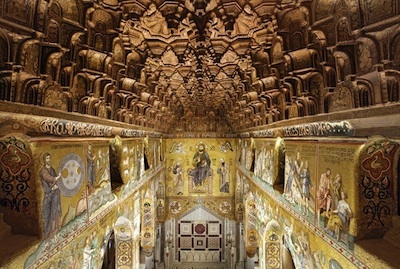 How do we get from the decorative to the cosmological? Yasser Tabbaa suggests an answer in his otherwise strictly historical study, The Transformation of Islamic Art during the Sunni Period (London: U. of Washington P., 2001). 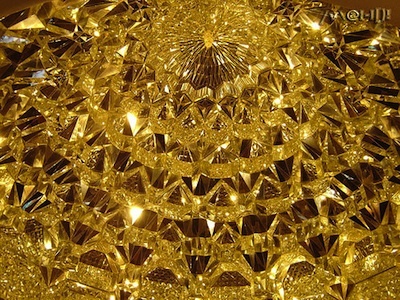 A highly empirical chapter on muqarnas [honey comb] vaulting and ash’ari occasionalism raises “the question of meaning in the muqarnas,” noting that “it has led to quite polarized interpretations, ranging from the usual fanciful readings by essentialist scholars to the rejections or ambivalent views of most art historians.” He cites Terry A. Allen as an example of positivist methodology, when Allen proposes that “geometric ornament and muqarnas are primarily visual inventions rather than intellectual constructs.” Oleg Grabar he cites to the contrary as holding that muqarnas was a neutral form “whose only purpose was to please.” Why the emphasis on pleasure? You do not tire of contemplating the roof [i.e., the ceiling], a cause of wonder and marvel to those who see or hear about it. Embellished as it is with delicate carvings, which are executed as differently shaped coffers and shining with gold from all sides, it imitates the clear sky of heaven, illuminated with gold from all sides. *With Superstring Theory we must invent the mathematics as we go along, unnerved by the realization that the reality may never otherwise manifest itself. **The analogy in Sentence of the Gods is between in situ observation and the gods; individual books, with their observation of the actual world, and the larger sequences into which the books are organized, according to the major gods that correspond to the days of the week. I have . 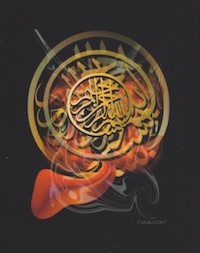 . . argued that two central tenets of the new theology — the uncreated and exoteric nature of the Qur’an and the occasionalistic view of the universe — bore directly on the transformation of the most important features of Islamic art, including qur’anic calligraphy, public inscriptions, vegetal and geometric ornament, and muqarnas vaulting. 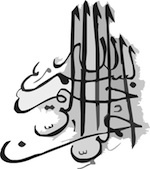 Specifically, I have proposed that the ash’ari view concerning the eternity of the Qur’an and the exoteric (zahiri) nature of the word of God directly contributed to the application of more legible cursive scripts to the Qur’an and the proliferation of these scripts in public inscriptions. I have also argued that the widespread acceptance of occasionalism among the theologians of the eleventh century would have contributed to the creation and proliferation of arabesque ornament, particularly in its most distilled and potent form, the muqarnas dome. It was not visual similarity, but difference, that communicated contested religio-political ideologies within the extensive Muslim domains whose internal boundaries were marked by constantly shifting abstract sign systems capable of conveying semiotic messages to insiders who were familiar with culturally determined codes. Despite their apparent unity, these visual signs hardly constituted a homogeneous “Islamic” style with fixed horizons; discontinuities and ruptures resulted in a lively spectrum of competing paradigms. Muslim philosophers and theologians devoted considerable thought to the nature of matter and the universe and their relationship to God. Even the most rationalist Muslim theologians rejected the Aristotelian concept of an eternal cosmos, because it contradicted the Islamic conception of God as the only absolute and eternal. . . . The Ash’aris of the tenth and eleventh centuries took over this atomistic cosmology and pushed it to its natural extremes, making it a cosmology of occasionalism, or a theory of atoms and accidents. Abu Bakr al-Baqillani (d. 1013), the chief Ash’ari theologian before al-Ghazzali, argued that the world, which to him was everything other than God, was composed of atoms and accidents. Accidents could not endure within matter (jawhar) for longer than an instant, but were continuously being changed by God. It follows, then, that the attributes of matter (color, luminosity, shape, etc.) are transitory accidents that change according to the will of God, and that even the preservation of matter — the collocation of its atoms — requires the continuous intervention of God. The occasionalism of al-Baqillant therefore ascribed to God not only the first act of creation but also the unending process of preserving the created world from one instant to another. Through a continuous process of annihilation and recreation, God alone can guarantee the order and consistency of the universe by preserving the accidental combination of atoms. This cosmology embodied the wisdom and knowledge of an omnipotent God, who had directly created the universe in time and without any intermediaries, and who was continually involved in maintaining its order, balance and coherence. This theory differed from the Mu’tazili, Isma’ili and even Shi’i views of the universe, which, in varying degrees, held to the belief that the universe was an external emanation existing independently of God and subject to its own natural law. . . . The parallels between occasionalistic cosmology and the muqarnas dome are very striking indeed, displaying on the macro and micro levels ideas of fragmentation, impermanence and imminent collapse. Indeed, the seemingly complete confluence between the attributes of occasionalism and the perceptual properties of the muqarnas dome was intended as an architectural manifestation of this thoroughly orthodox Islamic concept. 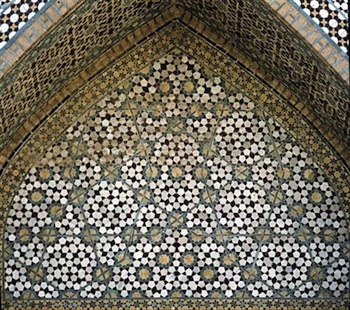 In order to represent an occasionalist view of the world, a fragmented and ephemeral looking dome was created by applying muqarnas to its entire surface, from transition zone to apex. This procedure creates a comprehensive effect intended to reflect the fragmented, perishable and transient nature of the universe while alluding to the omnipotence and eternity of God, who can keep this dome from collapsing, just as he can keep the universe from destruction. The likely origin of the muqarnas dome in Baghdad in the early eleventh century coincides with the triumph of Ash’ari thought and occasionalistic cosmology. More specifically, during the pivotal period of Caliph al-Qadir, his chief theologian and apologist, al-Baqillant wrote treatises and issued manifestos opposing Mu’tazili theology and Fatimid rule as well as valorizing Sunni traditionalism and Abbasid rule. . . .
Grabar does not base his interpretation of these magnificent domes on their form but rather on richly evocative poetic and prosodic texts, some of which are inscribed on the very walls supporting the domes. [Tabbaa quotes one such poem.] As with earlier Christian descriptions of muqarnas domes, this poem extols the celestial qualities and heavenly associations of the domes, whose various components have left their terrestrial tethering and joined the orbits of stars and constellations. As Grabar emphasizes, this description goes even farther, comparing the domes to the rotating dome of heaven, a concept dating back to classical antiquity but still resonating in medieval times. This brilliant interpretation is obviously specific to the domes of the Alhambra and can neither be projected backward onto earlier muqarnas domes nor be used to impute an absence of meaning to other domes that cannot sustain such an interpretation. Rather than undermining our Ash’ari reading of the muqarnas dome, Grabar's interpretation actually embellishes it by giving it a new dimension acquired in the intervening two or three centuries of development. To summarize briefly, the muqarnas dome was created in an atmosphere of heightened religious dogmatism and intense political opposition to the Fatimids. Just like the proportioned scripts of Ibn Muqla, it was simultaneously intended to pay homage to the Abbasid caliphate and to embody the central cosmological tenets of the Sunni revival. Despite its great ubiquity after the twelfth century it was not known in early Islamic architecture and not very significant in its later phases, but epitomized certain transformations that took place during its middle period. . . . The muqarnas dome, despite its sometimes astounding complexity, is in fact a closed and finite system, whose meaning lies not in allegorical narratives from a sacred text nor in images that provide a window onto another world, but in the intricacies of the form itself. It restricts perception to the immediately tangible universe and directs meditation toward an all-powerful God. Their relationship is considered to be eternal; it is said that, if their relationship were to vary, Life would cease to exist. Here is perceived an analogy with the three elements in C.
C. At the center of the triangle of Allah, Rahman and Rahim is the Human. C. may be regarded as a religious allegory of A. The triangle is the first polygon, the minimal expression of an area, and the simplest figure to which the other polygons can be reduced. It is also symbolic of the minimal requirements of consciousness (i.e., Knower, Known and the act of Knowing), as well as the minimal description of the basic biological needs: ingestion, absorption and excretion. اعتقد فيثاغورث أن التأمل كان الطريق الذي قاد إلى نظام الترتيب الكوني، ومن ثم إلى تنفيس العواطف (تطهير الذات). لذا بإمكاننا، وفقاً للقانون الكوني، الإرتقاء من الأمور الغريزية الفظة صعوداً باتجاه روح الكون وجوهره, ومن ثم إلى ماهو سماوي أو إلى الله. إن تأكيد علماء ومفكري الإسلام على فكرة التوحيد، والتي تعني وحدانية الله، قد ساهم في تبنيهم فكرة ماورائيات الأرقام الفيثاغورية، حيث أن هذا المذهب، وكمذهب الأفلاطونية الجديدة السابق له، قد التزما بفكرة الوحدانية كحالة بارزة تربعت على عرش جميع المعارف البشرية. إن علم ماورائيات الأرقام، ومع ظهور العلوم الحديثة (التي أعادت إلى المشهد نظرية متعددات الأوجه التي عفا عليها الزمن والتي اعتقد أفلاطون أنها مفتاح هذا الكون)، ربما كان مصيره الإندثار لولا ظهور أخوان الصفا في القرن العاشر الذين تابعوا تقديسهم لفيثاغورث. تماماً كما جاء عند فيثاغورث، فإن إخوان الصفا في رسائلهم الإثنتين والخمسين قالوا بأن الرياضيات هي الطريق الذي يقود إلى التهذيب الأخلاقي والإستبصار الفكري. حيث أنها تعد بمثابة مفتاح لمعرفة الذات، بينما اعتبرها الإغريق طريقاً لأسمى مراتب المعرفة، ألا وهي معرفة الله. بالنسبة للمسلمين، فإن التفاصيل العديدة لعلم الأرقام الفيثاغورثية ليست بتلك الأهمية، سيما وأنها لم تعد ذات مصداقية. أما بالنسبة لنا كغربيين، فإننا لم نعد نؤمن بالعناصر الأربعة ولا بالخصائص الأربعة أو حتى الأمزجة الأربع. بينما ظل المسلمون يعتقدون بوجود الروح على أنها السبب الكوني الذي يقود إلى الله. تتطرق الرسالة الثانية من رسائل أخوان الصفا إلى مسألة علم الهندسة، بينما تتحدث الرسالة السادسة عن "علم هندسة الأرقام والنسب المتوافقة". كما يتم وصف جوهر الأجسام السماوية في مكان آخر من الرسائل بـ "الطبيعة الخامسة"، أي الجوهر الخامس. وبهذا تنأى هذه الأجسام عن غيرها من الموجودات الأخرى المرتبطة بالتكاثر والفساد. سبعة أجساد سماوية تخرج عن سيطرة الجاذبية الأرضية، ذلك أن الله قد خلقها منذ البدء (وهي تشبه مراحل الحكم السبعة في كتاب ماديسون موريسن). فهذه الأجساد لاتزال معلقة بمكانها الأصل، بينما ظلت الموجودات الأخرى بسبب الجاذبية مجبرة على البقاء بأماكنها الطبيعية تتوق للإنضمام إلى الأجساد السماوية السبع. كما لاتقل مسألة التوفيق بين الرياضيات الأسطورية والعلوم الحديثة أهمية عن الإيمان بالمذهب القائل: "معرفة العالم يجب أن تبدأ بمعرفة الذات أولاً"، وأن هذه المعرفة سابقة لأي معرفة أخرى. ومن هذا المنطلق توجب على المسلم المؤمن معرفة ذاته قبل معرفة العالم الخارجي المحيط به. ومن أجزاء المعرفة الأربعة: المعرفة الرياضية والمعرفة الفيزيائية والمعرفة النفسية الفكرية والمعرفة العدلية اللاهوتية، يحتل الجزء الثالث من أجزاء المعرفة مرتبة بالغة الأهمية، حيث يُعتبر علم النفس بالنسبة لأخوان الصفا فاتحة إلى علم الماورائيات وعلم الكونيات ومنه إلى كل أنواع العلوم والمعارف (ويعد علم النفس من العلوم الداخلية والخارجية).